I'm always looking for new knitting projects with a lot of bang for my buck -- just a smidge of a challenge with potentially fabulous results. After finding Leigh Radford's book One Skein: 30 Quick Projects to Knit or Crochet at my local library, I decided to get my own copy so I could play around with the projects and patterns inside to my heart's content. "The Clutch You'll Never Give Up" has quickly become one of my favorite patterns in the book. 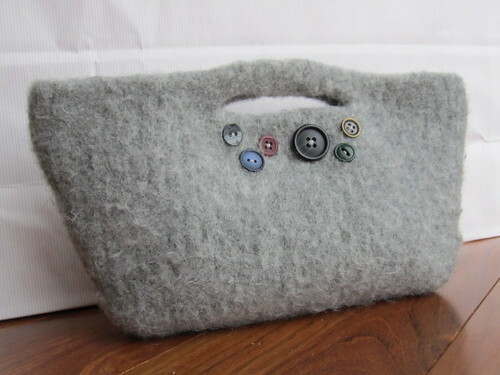 The clutches knit up oh-so-quickly in 100% wool, and after a quick turn in a hot-water washing cycle, they're felted and perfectly shaped and ready for just a few embellishments before being gifted to my friends. This version in light grey may be my favorite yet. It has a new home with my friend Sarah, who likes it just as much as I do. See? The perfect gift.